Customer: U.S. Operating Services, Scrubgrass Generating Station. Contact: Philip Jones, Plant Engineer. The Scrubgrass Generating Station owns and operates a Crisafulli FLUMP system. 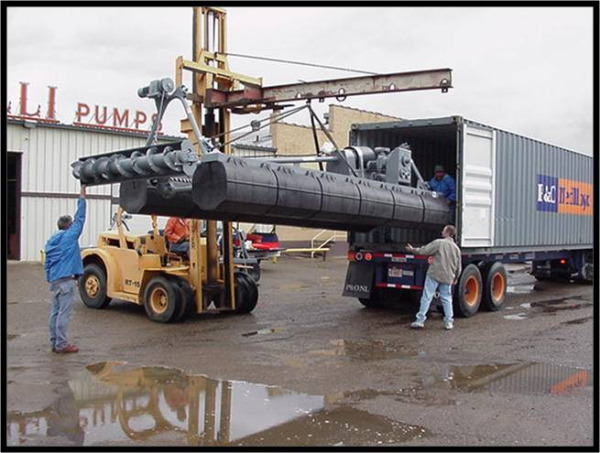 The FLUMP was manufactured with an abrasion resistant hardened carbon steel Crisafulli J-series slurry pump. The FLUMP dredge is operated manually from an on-shore control panel. Slurry is pumped to a drying bed for several lagoons at distances up to 800 feet. The slurry consists of water and fly ash with specific gravity of approximately 2.0. The slurry has solid concentrations of up to 20% (weight). The Crisafulli FLUMP dredge is operated manually between 6 and 8 hours per day as manpower, weather and logistics of slurry removal allow. The system consists of a 25 HP slurry pump, steel platform and floatation package with a polyethylene floating discharge system. Manual control of pump, traverse and depth functions is affected at the control panel. Lateral positioning is controlled by a manual, 4-post traversing system utilizing endless cable tensioners and wire rope.